Some of NI's largest businesses have written to MPs urging them not to let the UK leave the EU without a deal. They say that no-deal would "result in significant damage to our export markets, supply chains, consumer spending power and the region's competitiveness". The letter has been organised by the employers organisation, the CBI. The DUP have said they should not "fall into line with the Government's attempt to foist a really bad deal on the UK". The signatories are a range of locally-owned and multi-national businesses. 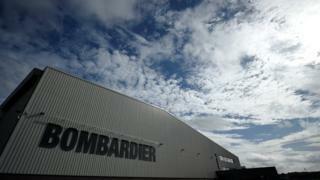 Aerospace firm Bombardier, Norbrook pharmaceuticals and Graham construction group are among the signatories. The letter suggests that a no-deal could lead to the introduction of new checks at the Irish border. It states: "A no deal Brexit will undoubtedly result in creating regulatory and tariff differences across the island of Ireland and will therefore have direct consequences for border checks and crossings. "We therefore urge MPs across the UK to consider the damaging impact on Northern Ireland's economy and political stability in the event of a no-deal Brexit." Responding to the letter, DUP MP Sammy Wilson said: "It is clear that there is a coordinated attempt to railroad MPs into accepting the toxic, union-destroying, Northern Ireland economy-damaging deal, which the prime minister had previously agreed with the EU. "It is important that businesses in Northern Ireland do not simply fall into line with the government's attempt to foist a really bad deal on the UK because of its incompetence in negotiations." Last week, the head of the NI civil service warned that a no-deal Brexit could have "grave" consequences including a "sharp increase in unemployment".